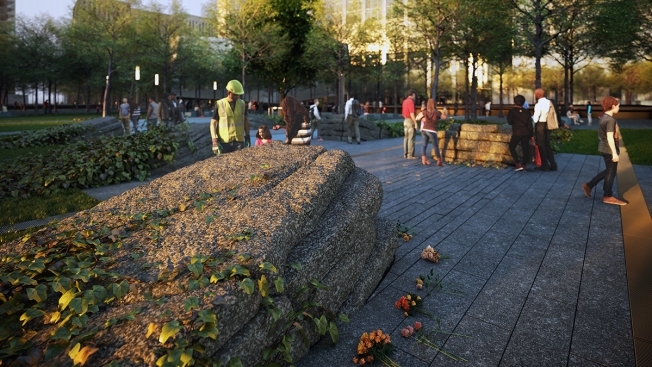 The 9/11 Museum and Memorial released this animated video of an installation called the Glade, which is under construction. Giant granite monoliths weighing up to 17 tons were carefully put in place at the 9/11 Memorial and Museum on Saturday as part of a new installation honoring first responders. The installation, called "The Glade," includes six monoliths pointing skyward along a path. The monoliths are intended to represent strength and determination through adversity. A 600-ton crane lifted the monoliths into place at the memorial in lower Manhattan. "This is an area of the 9/11 Memorial that is being created to recognize and honor everyone who is now, 18 years after the attack, still living with the consequences of 9/11 -- day in and day out," said Alice Greenwald, president and CEO of the memorial and museum. The 9/11 Museum and Memorial released this drawing of how the Glade is intended to look when it's completed. "'The Glade' would also, when completed, be a tribute to the incredible selflessness, determination and commitment of everyone who worked on the recovery here at what was ground zero," Greenwald said. When "The Glade" was announced in 2017, there were more than 77,000 9/11 responders and survivors participating in the World Trade Center Health Program. More than 39,000 had at least one condition related to 9/11 and more than 6,000 had a 9/11 related cancer. A dedication is planned for "The Glade" on May 30.